Be the first to share your favorite memory, photo or story of MaryJane. This memorial page is dedicated for family, friends and future generations to celebrate the life of their loved one. Saint Albans, VT – MaryJane Roy a resident of this area for the past seven years passed away Wednesday, January 30, 2019, at the McClure-Miller Respite House with her family at her side. Born in East Lyme, Connecticut on November 2, 1939, she was the daughter of the late Joseph and Grace (Tower) Earley. MaryJane was 79 years old. MaryJane was married to Leon G. Roy, who pre-deceased her on February 2, 2016. MaryJane and Leon were longtime residents of the North Branford and New Haven, Connecticut communities. 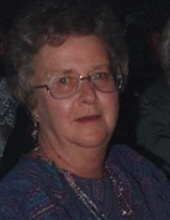 MaryJane was a longtime member of the St. Francis of Assisi Parish in New Haven and while in St. Albans was a communicant of Holy Angels Parish. She was a longtime associate of New Haven Drywall. Survivors include her children, Jeff Roy of DuBois, PA and Jennifer Callahan and her husband, Phil, of St. Albans, as well as her grandchildren, Jocelyn, Jeffrey, Justine and Amber Roy, Jameson Mori and his wife, Maria, and Shannon and Lia Callahan and a sister, Elizabeth “Betsy” Wilson of Enfield, Connecticut. In addition to her parents and husband, Leon, MaryJane was pre-deceased by a sister, Denice Murray. MaryJane’s family will receive friends on Saturday, February 2, 2019, from 3:00 to 5:00 PM at the Heald Funeral Home, 87 South Main Street, St. Albans. Father Maurice Roy will conduct a vigil service at 5:00 PM. A Mass of Christian Burial will be celebrated on Monday, February 4, 2019, at 11:00 A.M. at Our Lady of Pompeii Church, 355 Foxon Road, East Haven, Connecticut with entombment to follow in All Saints Cemetery. Those planning an expression of sympathy are asked to consider the McClure-Miller Respite House, 3113 Roosevelt Highway, Colchester, Vermont 05446. To send MaryJane’s family a message of condolence or share a memory, kindly go to her on-line guest book at www.healdfuneralhome.com. To plant a tree in memory of MaryJane Roy, please visit our Tribute Store. "Email Address" would like to share the life celebration of MaryJane Roy. Click on the "link" to go to share a favorite memory or leave a condolence message for the family.